Forget multi-touch and motion control: Eye-tracking technology will some day let PC users control their computers just by looking at them. The eye-tracking technology from Tobii Technology was on display in a prototype laptop at the CeBit conference in Hanover, Germany this week, where Engadget got an eyes-on demonstration. According to the blog, eye control worked "extraordinarily well," allowing the user to target open windows in an Exposé-style view. Exposé is a user-activated interface (by key press or mouse movement) in Mac OS X that launches a view of all open applications. In another demo at CeBIT, the user could bring up a dock of favorite applications by staring beyond the left side of the screen. There was also a game demo similar to Asteroids, in which the player destroyed floating rocks by looking at them, even when they were only a few pixels wide. Other companies are working on eye tracking technology, including one who last year demoed an eye-controlled Nintendo Entertainment System console. A press release from Tobii says users will also be able to zoom in on a map by staring at it and dim the computer's screen by looking away. Tobii hopes that eyesight controls will become a natural complement to traditional mouses and keyboards, rather than an outright replacement. Sounds awesome, but don't expect to control your PC with furtive glances anytime soon. Tobii has only produced 20 laptops in conjunction with Lenovo, and Engadget reports that the technology won't be commercially available for another two years. 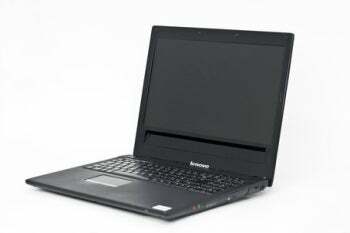 For now, it's a trade-off between accuracy and sensor size, with the demo laptop requiring a large hump on the back and an inch-wide strip that runs the length of the computer. But just imagine, in the future you may be able to upvote or downvote this story by blinking.